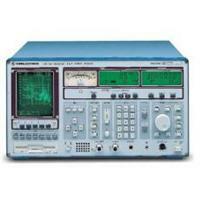 The R&S ESVD Test Receiver is equally suitable for the measurement of signal strength and interference. For planning and operation of mobile radio networks it is important to know the propagation conditions in the area to be covered. The ESVD Test Receiver features optimal bandwidths for mobile radio services as well as a high measurement rate so that it is ideal for fixed and mobile coverage measurements. The number of measurements required to ensure electromagnetic compatibility is continuously increasing in the field of RFI measurements. Thanks to the built-in intelligence of Test Receiver ESVD, the time required for such measurements is reduced considerably. Being also a specialist for EMI measurements to CISPR, CENELEC, ETSI, FCC, VCCI and VDE standards, the ESVD can furnish results more rapidly and accurately than has been possible up to now. The service-friendly modular design of ESVD ensures excellent results regarding RFI emission and immunity. A quiet, temperature-controlled blower minimizes self-heating of ESVD. Comprehensive built-in test functions allow any module requiring servicing to be easily identified and replaced independently of other modules. * the automatic test receiver which performs EMI measurements and reports the results is equally suitable for the measurement of signal strength and interference.